The first Stars-and-Stripes jerseys of the 2012 USA Cycling Elite, U23, Juniors & Paralympic Road National Championships were awarded Thursday night in Augusta, Ga. Riders were recognized with medals and jerseys for their performances in Thursday’s time trial at J. Strom Thurmond Dam and Wednesday’s road races at Fort Gordon. The elite women’s time trial consisted of 40 of the country’s best women time trialists competing on a 30-kilometer course, headed by 2012 Olympians Amber Neben (Lake Forest, Calif./Specialized-lululemon) and Evelyn Stevens (Dennis, Mass./Specialized-lululemon). The two London-bound athletes did not disappoint as the teammates took the top two spots of the podium, finishing 1.2 seconds apart. Neben used finishing second to Stevens in last year’s contest as motivation in 2012 as she recorded a 39:27.375. Stevens finished with a 39:28.583, 18 seconds faster than bronze medalist, Alison Powers (Pinecliffe, Colo./NOW and Novartis for MS), who registered a time of 39:46.498. Carmen Small (Durango, Colo./Team Optum p/b Kelly Benefit Strategies) and Alison Tetrick (Mill Valley, Calif./Exergy Twenty12) rounded the podium with times of 40:51.088 and 41:00.186, respectively. Larry Warbasse (Traverse City, Mich./BMC-Hincapie Sportswear Development Team) was the 10th rider out of the start house in the men’s U23 race. He scorched the 30-kilometer course with a time of 37:17.97, putting him in the hot seat. After two-thirds of the 60-rider field had completed their race, Eamon Lucas (Fremont, Calif./California Giant Berry Farms-Specialized) replaced Warbasse in the hotseat with a mark of 37:27.148. Lucas’ time stood until the fourth-to-last rider, the 2011 silver medalist Lawson Craddock (Austin, Texas/Bontrager Livestrong Team), finished with a seemingly unbeatable time of 36:57.66. The second-to-last rider of the category, Evan Huffman (Elk Grove, Calif./California Giant Berry Farms-Specialized) bested Craddock’s time by 17 seconds, posting a 36:40.735 to win the second national championship of his cycling career. The 2011 national champion, Nathan Brown (Covington, Tenn./Bontrager Livestrong Team), slid into third place, recording a time of 37:15.002. The day’s first time trialists were the juniors men 17-18, starting at 8 a.m. ET. The early start time did not daunt the competitors as 100 of the country’s best 17-18 time trial competitors toed the line in a 30-kilometer competition for the national championship. 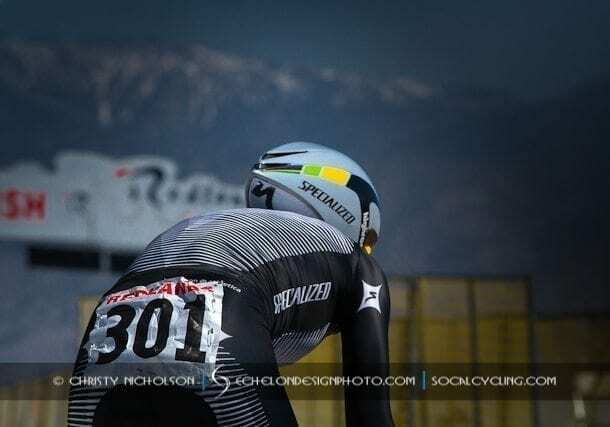 In the end, the riders from Slipstream-Craddock Junior Development posted three of the top five results, including the winner Gregory Daniel (Englewood, Colo.), who finished with a time of 37.45.758. Just over one minute behind him, in second place was T.J. Eisenhart (Levi, Utah/Velosport Racing), who finished in 38:45.606. The bronze medalist, with a time of 38:58.854, was Cameron Rex (Shawnee, Kan./Gateway Harley-Davidson). Daniel’s teammates occupied the final two spots as Michael Dessau (Boulder, Colo.) and Jordan Cullen (Hudson, Wisc.) posted 39:00.463 and 39:08.222, respectively. Julian Kyer (Boulder, Colo./Juwi Solar Cycling) bested a field of 57 elite men competitors by recording a 36:36.7 in the 30-kilometer time trial to collect the gold medal. The 2011 silver medalist in this contest, Timothy Mitchell (Ashland, Mass./CCB Racing), who had the luxury of being the last competitor in the start house, finished second, 15 seconds behind Kyer, with a time of 36:51.233. Brant Speed (Austin, Texas/787 Racing) finished third with a time of 37:24.204 while James Peterman (Boulder, Colo./Sonic Boom Racing). The winner of the elite men’s criterium in 2011, David Wenger (Austin, Texas/Bicycle Sport Shop p/b Integrity-Super Squadra), rounded out the podium in fifth place with a time of 37:37.611. In an 11-woman field, Kaitlin Antonneau (Racine, Wisc./Exergy Twenty12) rode away with the U23 women’s time trial, winning by 42 seconds. Antonneau traversed the 30-kilometer course in 42:26.346 while her closest competitor, Jessica Prinner (South Elgin, Ill./ABD Cycling Club), finished in 43:08.816. Finishing 44 seconds behind Prinner was Maura Kinsella (St. Louis, Mo./Vanderkitten-Focus) with a time of 43:52.558 to secure the bronze medal. Ashley James (Dousman, Wisc./NOW and Novartis for MS) posted a time of 43:59.679 to finish fourth while Danielle Haulman (Davis, Calif./TIBCO to the Top) finished fifth registering a time of 45:18.062. Addyson Albershardt (Matthews, N.C./NOW and Novartis for MS) torched the 23-starter field of juniors women 17-18, winning by almost 50 seconds. Albershardt completed her 19-kilometer ride in 28:28.621. The silver medalist, Grace Alexander (Boise, Idaho/BYRDS (Boise Young Rider Development Squad)), completed the course in 29:17.942, 16 seconds faster than the bronze medalist Kayla Sterling (Allen, Texas/Exergy Twenty12). Alexis Ryan (Ventura, Calif./Team TIBCO II) posted a time of 30:12.446 to finish fourth while Erin Donohue (Norwich, Vt./Killington Mountain School Cycling Team-Woodstock Bicycle Club) was only two seconds behind her with a time of 30:14.752. The juniors men 15-16 19-kilometer time trial was dominated by Slipstream-Craddock Junior Development as that team bested a field of 83 starters to earn the gold, silver and bronze medals. Zeke Mostov (San Francisco, Calif.) took the top prize with a time of 25:54.316, 19 seconds faster than silver-medalist Jake Silverberg (Pembroke Pines, Fla.). The bronze medalist, Adrien Costa (Los Altos, Calif.), finished six seconds behind Silverberg with a mark of 26:19.682, narrowly edging fourth-place William Barta (Boise, Idaho/BYRDS (Boise Young Rider Development Squad)), who posted a mark of 26:19.714. Rounding out the podium, in fifth place was the winner of the juniors men 13-14 time trial in 2011, Jack Maddux (Fresno, Calif./Team Specialized Racing Juniors), who registered a 26:51.481. Claire vanEkdom (Chevy Chase, Md./JET Cycling) built on Wednesday’s road race win by winning Thursday’s time trial by a significant margin. VanEkdom completed her 19-kilometer contest in 30:01.054 was 55 seconds faster than her closest competitor, Zoe Reeves (Grand Rapids, Mich./Einstein Racing). Reeves’ mark of 30:56.387 was four seconds faster than the bronze medalist Zoe Mullins (Altamonte Springs, Fla./Colavita Racing Inc.). Rounding out the podium were Kirsten Williams (Lone Tree, Colo./Natural Grocers Cycling Team) and Hannah Swan (Alpine, Calif./Strive Racing) with times of 31:04.465 and 31:19.081, respectively. Gage Hecht (Parker, Colo./International Christian Cycling Club) added a second gold medal from his haul from this event after winning the juniors men 13-14 time trial with a time of 13:23.14. The second-place rider, Sean McElroy (Palmdale, Calif./Team Specialized Racing Juniors) was 29 seconds behind him, finishing his 19-kilometer contest in 13:52.12. The bronze medalist, Christopher Blevins (Durango, Colo./Durango Devo) posted a time less than a half-second higher than McElroy’s, finishing in 13:52.57 while the fourth-place finisher Bo Knickman (Newbury Park, Calif./Breakaway from Cancer Masters) posted a time of 13:56.27. Ian Clarke (Killington, Vt./Killington Mountain School) finished his race against the clock in 14:03.67 to finish fifth. Gina Johnson (Park Ridge, Ill./Village-Verdigris Cycling) was 28 seconds faster than the closest competitor in the juniors women’s 13-14 10-kilometer time trial. Hannah Green (Boise, Idaho/BYRDS (Boise Young Rider Development Squad)) rode away with the silver medal with a 15:50.76 mark, five seconds faster than the bronze medalist Julyn Aguila (El Paso, Texas/Major Motion Cycling Club). Hannah Arensman (Rutherford College, N.C./DIY Junior Development Team p/b ABRC) finished fourth with a time of 16:27.240 and Ann Weigel (Clermont, Fla./Orlando Road Club Inc.) rounded out the podium with a time of 16:29.040. The juniors men 10-12 competition saw another repeat performance as Adam Croft (Toano, Va./Slipstream-Craddock Juniors Development), who won Wednesday’s road race, topped the podium with a time of 16:25.66. Davis Branyon (Gainesville, Ga./Frazier Cycling Juniors) finished the 10-kilometer contest in second place with a time of 16:53.69, about four seconds faster than the bronze medalist, Ben Clark (Portland, Ore./Beaverton Bicycle Club). Colton Villa (Johns Creek, Ga.) and Sean Quinn (Sherman Oaks, Calif./CPT) rounded out the podium with times of 17:09.83 and 17:17.284, respectively. The riders from the BYRDS (Boise Young Rider Development Squad) posted the best two finishes in the juniors women 10-12 group. The winner of Wednesday’s road race, Megan Doherty (Boise, Idaho), struck gold after traveling 10 kilometers in 15:38.908 while Abigail Youngwerth (Boise, Idaho), who finished third on Wednesday, climbed one step higher on the podium, placing second in Thursday’s time trial with a time of 17:29.072. Isabella Brookshire (Hendersonville, N.C./DIY Juniors Development Team p/b ABRC) barely missed the silver medal, but earned the bronze with a time of 17:29.632. The 2012 road race silver medalist, Katie Clouse (Park City, Utah/Cole Sport), placed fourth in the time trial while Lauren Garriques (Lake Forest, Ill.) rounded out the podium with a time of 17:41.776. A record number of cyclists competed in the 2012 U.S. Paralympic Road Cycling National Championships Thursday, aiming not only for national champion titles, but also spots on Team USA for the 2012 Paralympic Games. More than 110 athletes, an increase of 25% from 2011, registered for the 19-kilometer time trial at the J. Strom Thurmond Dam and Lake, just over the state border in South Carolina. The event was the final race influencing the selection of road cyclists for the 2012 U.S. Paralympic Team that will compete in London later this summer. Winning national titles on Thursday were: Allison Jones (Colorado Springs, Colo.) won the women’s C2, Jamie Whitmore (Mount Akum, Calif.) won the women’s C3, Megan Fisher (Missoula, Mont.) won the women’s C4, Kelly Crowley (Redwood City, Calif.) won the women’s C5, Cassie Mitchell (Atlanta, Ga.) won the women’s H1, Marianna Davis (Salt Lake City, Utah) won the women’s H2, Monica Bascio (Evergreen, Colo.) won the women’s H3 and the tandem of Karissa Whitsell (Colorado Springs, Colo.) and pilot Debbie Milne (Belden, Miss.) won the women’s BVI national championship. The men who won national titles were: Douglas Schneebeck (Albuquerque, N.M) won the men’s T1, Steven Peace (San Diego, Calif.) won the men’s T2, Anthony Zahn (Lincoln, Neb.) won the men’s C1, Aaron Keith (Woodinville, Wash.) won the men’s C2, Joseph Berenyi (Oswego, Ill. won the men’s C3, Sam Kavanagh (Bozeman, Mont.) won the men’s C4, Mark Gyulafia (Portland, Ore. won the men’s C5, Anthony Pedeferri (Camarillo, Calif.) won the men’s H1, William Lachenauer (Reno, Nev.) won the men’s H2, Carlos Moleda (Bluffton, S.C.) won the men’s H3, Dane Pilon (Raleigh, N.C.) won the men’s H4 and the tandem of Clark Rachfal (Annapolis, Md.) and pilot David Swanson (Tucson, Ariz.) won the men’s BVI. Results from Thursday’s Paralympic time trial will help determine the athletes selected for the team that will compete in the time trial at the Paralympic Games in London later this summer. The team will be announced during one of the podium ceremonies on June 22 in Downtown Augusta. The six-corner criterium course to be contested on Friday in Downtown Augusta will highlight the nation’s top sprinters featuring a varying amount of laps (depending on age group) around a 1.25-kilometer course with a maximum elevation gain of only three feet. The 2011 edition of the criterium was certainly memorable as officials decided to shorten the race to avoid an incoming thunderstorm. The decision proved correct as thunder cracked and rain poured just as Shelley Olds (Gilroy, Calif./AA Drink-Leontien Cycling Team.NL) crossed the finish line to earn the Stars-and-Stripes in that event for the second consecutive year. Five national champions were crowned after winning road races on the first day of the 2012 USA Cycling Juniors, Under-23, Elite & Paralympic Road National Championships on Wednesday at Fort Gordon in Augusta, Ga.
Juniors men 10-14 and women 10-16 contested road races of varying distances on the 11-kilometer course in temperatures hovering in the mid-80 degrees.